Talent shows have become a huge hit over the past couple of decades, serving people the idea that with some hard work and some luck they can have their artistic dreams and aspirations come true. The plot of the 2006 movie American Dreamz revolves around one such imaginary talent show, which attracts people from different walks of life. The movie itself is a cultural satire, with plenty of funny situations, culminating in a tragic yet funny end, trying to emphasize the point that, at the end of the day, it is all just one big spectacle for the masses. Whatever happens during the show, the only thing people care about is their personal entertainment. American Dreamz certainly brings forth some valid points but that doesn’t change the fact talent shows have become an important part of our modern culture. As such, it is no surprise they also found their way into the world of online gambling and the Britain’s Got Talent slot is a perfect example of this. 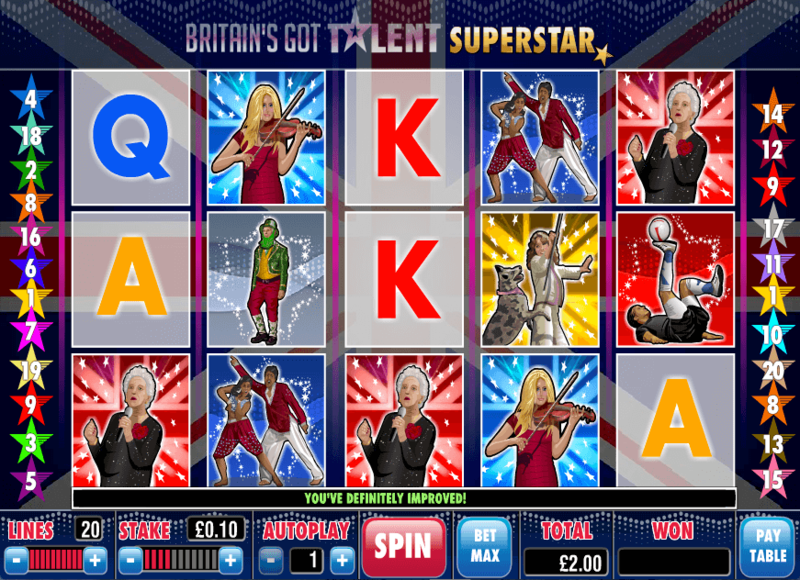 Developed by Playtech, the Britain’s Got Talent slot is based on the talent show of the same name, which premiered in 2007. The popular casino game developer decided to take advantage of the show’s popularity and got the license to create a slot that was guaranteed to attract a huge number of players. Britain’s Got Talent features five reels and up to 20 pay lines. Reels are filled with symbols representing silhouettes of people singing, juggling, dancing, etc. Alongside these, there is also the British flag, serving as the wild symbol, the Free Spins scatter, as well as the game’s logo, triggering the Britain’s Got Talent special bonus feature. There are two bonus modes in this slot. The first, more interesting one, is triggered by landing three Britain’s Got Talent Bonus symbols. Players are taken to a new screen, where they can pick the skill they wish to perform, choosing between dance, musical, and novelty acts. Once you pick your talent, the Live Show Bonus Game begins. The goal of the bonus is to get through several stages and reach the show finale. At the end of each stage, players are awarded credits based on how loud the applause is. The maximum payout from this bonus is 1,125 times the bet. The second bonus consists of free spins awarded by landing three free spins’ scatters. Each of the scatters reveals a certain number of free spins and they’re all added together for the total amount. The maximum number of free spins is 20. During free spins, wild symbols are added randomly to the reels and become sticky for the duration of the round. If you’d like to see if you have what it takes to go all the way and become the next big talent, you can try the Britain’s Got Talent slot for free using free spins. There are several online casinos that offer no deposit free spins to their new players, so you can try your luck with no risk involved. If you don’t know where to look, check out the CasinoReviews site, where you’ll find a detailed list of the latest no deposit free spins bonuses.